Susan Petersen is a free spirit. It's what led her to stumble on a simple idea that is now embraced by Hollywood's elite. After having her second child, Petersen had a hard time finding comfortable baby shoes for her newborn son. Frustrated, she bought a bag of scrap leather from a yard sale, sat at her kitchen table and got to work. 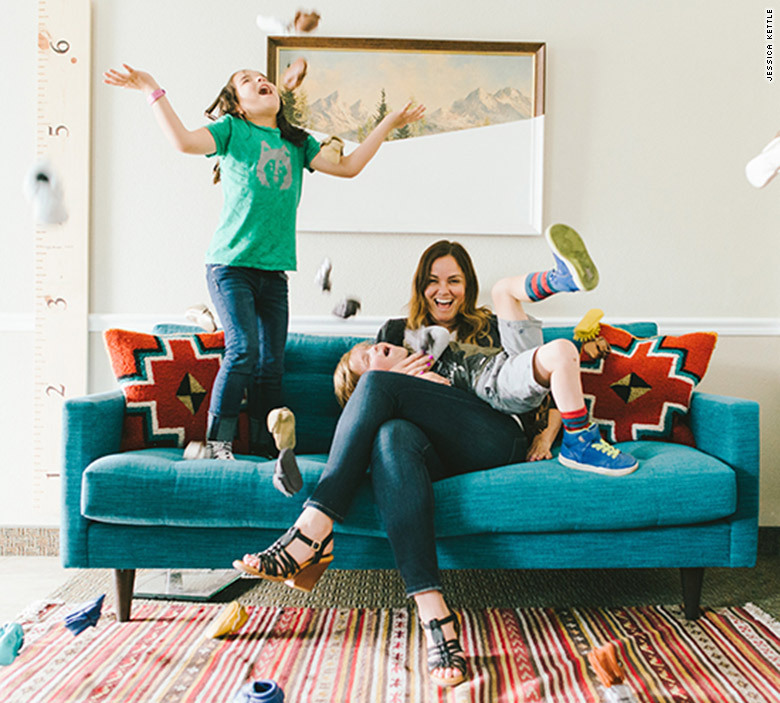 Six years later, her Provo, Utah-based startup Freshly Picked has sold over 80,000 pairs of moccasins and generated $5.2 million. The shoes, which feature a unique fringe pattern and elastic at the opening (to ensure they stay on), are sold online and in high-end stores like Nordstrom (JWN) and Kitson. What's more, the baby shoes have garnered a growing celebrity fanbase. 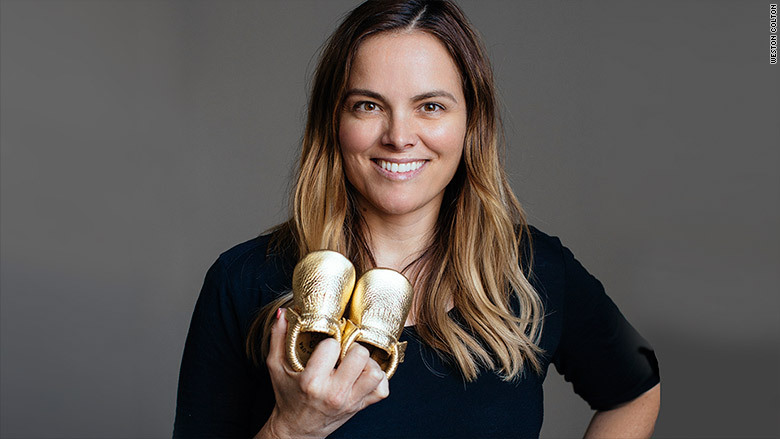 "Kim Kardashian has ordered a few pairs," said Petersen, noting that the star later Instagrammed a photo of North West in the shoes.. And celeb moms including Kelly Clarkson, Lisa Ling, Jessica Alba and Jessica Simpson have featured the shoes on their tots. The shoe's unique design is inspired by Petersen's heritage. "My grandmother is Native American and I grew up wearing moccasins," said Petersen, 36. Petersen's son Gus inspired her startup. She grew up in Pasco, Wash., as one of six siblings. After graduating from high school, Petersen opted not to go to college. She later married and settled down as a stay-at-home mom. When she had her daughter in 2006, she still wanted to keep working. So she made baby clothes and sold them on Etsy (ETSY). But money was tight. So she had to get creative when funding her startup. Petersen's brother had a window installation business. She talked him into giving her the old frames, which she sold the materials from -- making $200. This was enough to purchase some more leather scraps and start featuring the shoes on her Etsy shop. She's been bootstrapping the business ever since, and she only took her first paycheck last year. Her Freshly Picked baby moccasins (priced at $45 and $60) are made in California and Mexico and come in 45 colors. The latest collection features patterns like bananas and tropical palm leaves. Petersen is expanding into baby clothing this year. Petersen with her son Gus, 6, and daughter Hattie, 8. She's also eager to create more jobs. "Our first hire was a seamstress, and she still works for us," said Petersen. The business has 12 employees and she hopes to hire five or six more in the coming months. "I remember when the moccasins were taking off -- I was sitting in a Target parking lot. My whole life I've wanted to go to Target and buy whatever I wanted to. Now I could," said Petersen. "I want my employees to feel the same way. There's nothing I like more than seeing people succeed."